certifiies that Salessi turned 1/2 Million into $2 Millions in 3 months with a handful of trades! This certificate, and 2004 disclosures, prove that Salessi has advanced know-how of the workings of specific financial markets, instruments, and instrumentalities, and can testify as a rare expert-witness, to many Fed.-based counterfeiting crimes which Fed.-fraudsters claim to have occurred by accident…. Since 2004, in my case #04CC11080, I exposed the chain of events leading to the current economic meltdown and the plunder of America’s homes by a few criminal domestic, and foreign, enemies cloaked as bankers as I discovered it in 2002 . Probably every institutional mortgage loan, created during this decade was a forgery, and amounted to counterfeit dollars of the loan amounts multiplied by the number of times those counterfeit dollars (NOTES) changed hands in secondary markets. Thus, a note of $100,000. equaled the counterfeiting of at least $10 millions of counterfeit dollars. Counterfeiters used all means to prevent disclosures of their forgery operations, such as by “the strategic [character] assassination of Elliot Spitzer”:.youtube. (Mysteriously removed after posting it frombrasschecktv HERE IS THE SOURCE: gregpalast. Many banks, real-estate, title, escrow, and others in the chain of sale of American real estate engaged in countless forgeries of documents. “Law enforcements” denied responsibility and refused to take action against institutional forgers, telling victims that their problems were of civil nature. Corrupted sheriffs terrorize victims by selling, and executing, their honest services to organized crime lawyers and against the public. Courts support hired-gun lawyers, hired by institutional forger-counterfeiters, to kill victims’ civil lawsuits to assure the chain of plunder remained undisturbed, and continued to its astronomical levels of around $1,000 TRILLIONS, an amount of wealth that can’t be created for the rest of history, and the resulting of an upcoming collapse of the dollar to oblivion. 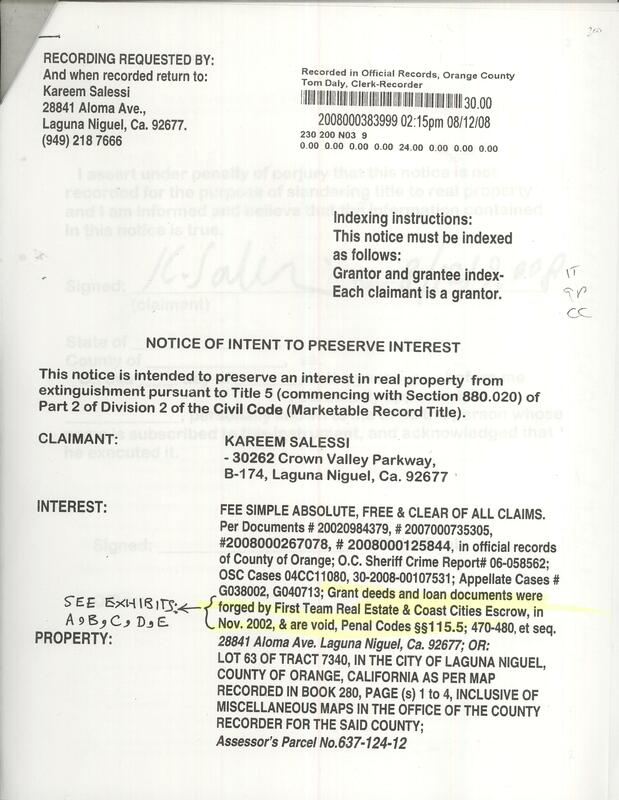 Many courts resorted to forgeries of their own records in support of fraudulent lawyers of institutional criminals, like many banks, realty, escrow and title companies. Courts even forged their own transcripts. All of these happened to me, in Orange County, California (“the World Capital of Fraud”), and I documented them in my lawsuits, and will try to compile a collection of them here to provide public awareness of the invisible organized crime webs which have been plundering this country, and the world, under colors of law, justice, democracy & freedom [for counterfeiters]. All the courts in which I presented proofs of forgeries in my cases supported the criminals by ignoring the uncontested forgeries, as if forgery and counterfeiting was the law, and issued orders and judgments in favor of the criminals, sometimes even without hearings! I will gradually post court documents in proof of this. The audio link below is my oral argument in an Orange County, Ca. Court of Appeal, on 9/18/2008, where I testified to the forgeries documented below, and to much more. Lawyers for forger defendants First Team Real Estate, Wachovia, and Alpha Appraisals, did not object to any of my felony-forgery charges against their clients (ie: they accepted all the charges). Despite that, the court entered an opinion in their favor dismissing them from the lawsuit, in spite of the fact that the trial court judge had already regretted the dismissal of the defendants and stated on the record that he would like to see his decisions reversed and the case remanded for trial! The unpublished opinion of the Court of Appeal Case # G038002 is available at this link: .fearnotlaw.